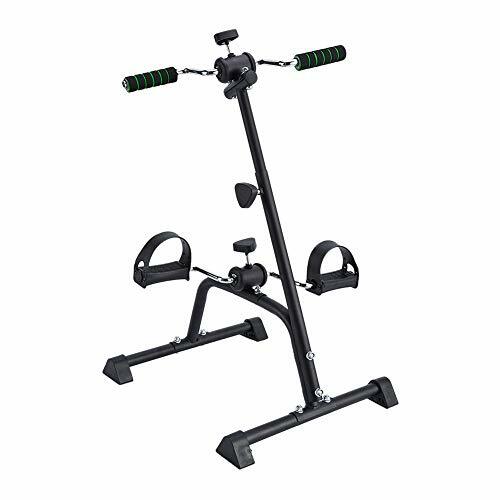 ADJUSTABLE TENSION AND HEIGHT: Low impact design and resistance can be adjusted, from low to high, step by step to toning muscles, and you can adjust height to fit the height of your seat. GOOD FOR FITNESS: With this pedal exerciser, you can exercise both your arms and legs when you are chatting or watch TV, increasing blood circulation, exercising joint flexibility, improving stamina and relieving tension. STABILITY AND NO NOISE: Mini exercise bike is compact designed, sturdy frame and non-slip feet keeps stable, reinforce security. There are no noise when using. NOTICE: PRODUCT UPGRADE. THIS PRODUCT HAS BEEN REDESIGNED AND UPGRADED IN CONSTRUCTION. Requires simple assembly to used, with tools in the box. Heat is a normal phenomenon during use, do not touch after prolonged use. WHAT YOU GET: A SYNTEAM compact pedal exercise bike, a manual, tools.